steam engine, for driving factory machinery, that a constant operating speed became necessary. Between the years 1775 and 1800, Watt, in partnership with industrialist Matthew Bolton, produced some 500 rotative beam engines. At the heart of these engines was Watts self-designed “conical pendulum” governor: a set of revolving steel balls attached to a vertical spindle by link arms, where the controlling force consists of the weight of the balls. Centrifugal Governor is shown above in the figure which maintains the mean speed of the engine when there is variations in the load. It basically works on the principle of balancing of the centrifugal force on the flyballs by equal and opposite radial forces. 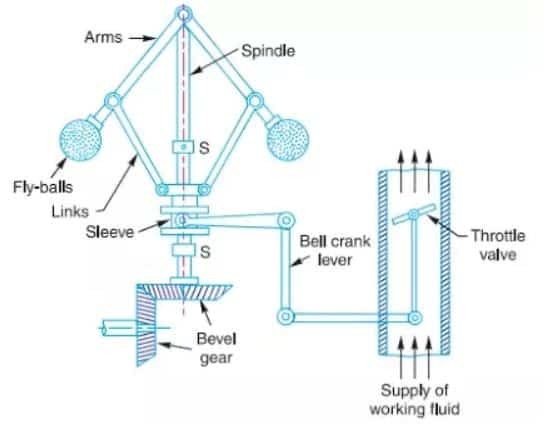 Spindle axis is driven by bevelled gears of engine shaft which rotates the flyball and it is connected to the sleeves with the help of links. Sleeves can slides up and down along with flyball along the spindle axis. To limit the motion of sleeves up and down two stops are there. Throttle valve is connected to the sleeves through bell crank lever which can controls opening and closing of the valve. When the load on engine increases, its speed decreases. The flyball’s speed and speed of governor’s spindle which is geared with engine shaft also decreases and consequently throttle valve opens, increases the supply of fluid and hence engine speed increases and vice-versa when load decreases on engine, its speed increases and hence throttle valve closes to decrease the supply of fluid and hence speed decreases.